Today ( 11 August 2017) has carried a detailed story on Education Loan interest subsidy scheme. Though the Government of India every year promises 100% interest subsidy during the study period plus one year for the eligible students, in reality only a small portion of 20 to 25% is being released by the Government. 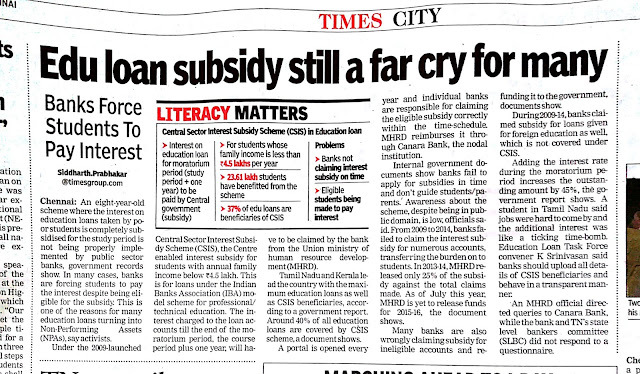 The banks do not claim interest subsidy for all eligible students, with the result that many eligibile poor students are denied the subsidy. Education Loan Task Force (ELTF) has taken up this issue several times with Government of India directly and through Members of Parliament. Because of this, students are burdened with NPA, for no fault of theirs. Even for 2015-16, only a small portion of around 20% is released recently. Nobody knows when the Governmetn will release the balance amount. For 2016-17, the portal is not yet opened for filing claim. Meanwhile, banks charge huge interest on the education loans and also treat the portion of the interest subsidy not received from the Government as NPA of the student. Since the Government is not able to handle interest subsidy effectively, ELTF has been demanding 'interest free loan' with some terms and conditions. Please read the TOI story on euu loan mess up. Scanned copy of the report is attached. It can also be read in the following link.